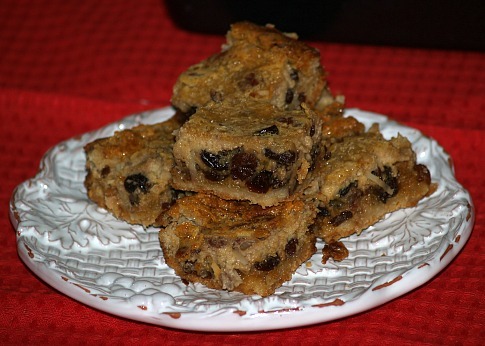 I learned how to make bar cookie recipes many years ago; they are some of my favorites and they are easy to make cookies since you can bake them in one pan. When in a hurry it saves so much time by not having to make individual cookies. I also love to eat bar cookies; they are some of the most delicious when it comes to flavor. As I was learning how to make bar cookie recipes I found that most start with some kind of a base; sometimes it might be a plain shortbread dough, oatmeal or chocolate base. Multiple layers make up a blend of different flavors. This is why there are hundreds of different recipes; some very similar and others very different. A simple dough base of flour, sugar and butter produces a rich tender shortbread. A few drops of vanilla, almond or rum extract will give additional flavor. You can also add chocolate to this mixture to make a chocolate base or oatmeal for oatmeal crust. Rubbing the butter into the flour and sugar produces moist crumbs that can be pressed in the bottom of a pan to make a crust. I learned how to make my bar cookie recipes, for the most part, by baking the crust long enough just to set the crust. After baking the crust additional ingredients are layered. These ingredients might be dried fruits, apricots, dates, figs, jams, nuts, raisins or custards. Many recipes require cooking this filling first but some might be directly from a package or jar. Often on top of this filling another layer will be added such as crumbs, nuts or a frosting. Most of you know how much I love cooking with sour cream; bar cookie recipes are no exception. The flavor which is added from the sour cream is just simply wonderful! NOTE: Cutting bars is easier if you score the bars as soon as the pan comes out of the oven; when bars cool, cut along the scored lines. Combine flour, brown sugar and butter; mix until fine crumbs. Stir in nuts; press 2 ¾ cups of crumb mixture in bottom of ungreased 9 X 13 inch baking pan. To the remaining crumb mixture add cinnamon, soda, salt, sour cream, vanilla and egg. 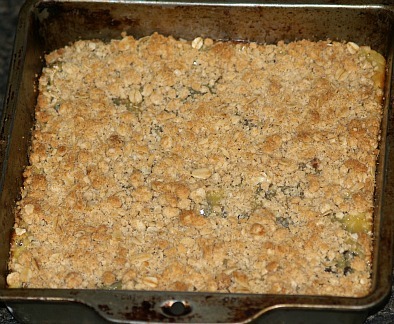 Blend mixture well and stir in apples’ spoon mixture evenly over crumb base. Bake in preheated oven at 350F degrees for 30 to 40 minutes. Cream butter and sugar; combine flour, oats, baking powder, soda and salt and add to creamed mixture. Blend mixture until crumbly; reserve 2 cups of crumb mixture. Pat remaining crumbs in bottom of greased 9 X 13 inch baking pan. Bake in preheated oven at 350F degrees for 15 minutes; cool. Combine in saucepan the egg yolks, 1 cup sugar, cornstarch, raisins and sour cream. Cook and stir over medium heat until thickened; pour and spread over baked crust. Sprinkle reserved crumbs over top of cooked mixture; bake 15 minutes. Combine flour, ½ cup sugar and softened butter; blend until crumbly. Press into lightly greased 9 inch square baking pan. Bake in preheated oven at 350F degrees for 12 to 15 minutes or until edges are lightly browned. Beat together mixed sugars, milk, sour cream, eggs, cinnamon, nutmeg, salt and vanilla. 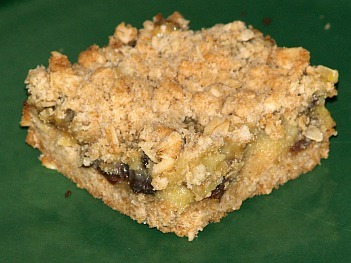 Fold in raisins, coconut and chopped nuts; pour over crust and return to oven. Bake about 40 minutes or until knife inserted comes out clean. Filling may puff during baking but will drop during cooling. Combine flour and powdered sugar in small bowl; cut in butter until crumbly. 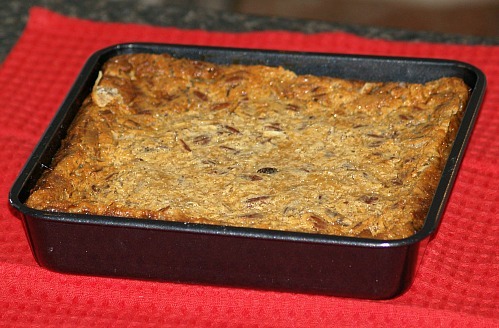 Press into ungreased 9 inch square baking pan; bake 15 to 18 minutes to brown. Spread jam over warm crust; mix filling. In small bowl beat cream cheese and milk until creamy; beat in melted white chips. Spread smooth mixture over the jam layer; cool completely then refrigerate 1 hour. FOR GLAZE melt chocolate chips and shortening in microwave stir until smooth. Spread glaze over the cold filling; refrigerate for 10 minutes. Cut into bars; chill 1 hour longer until set.